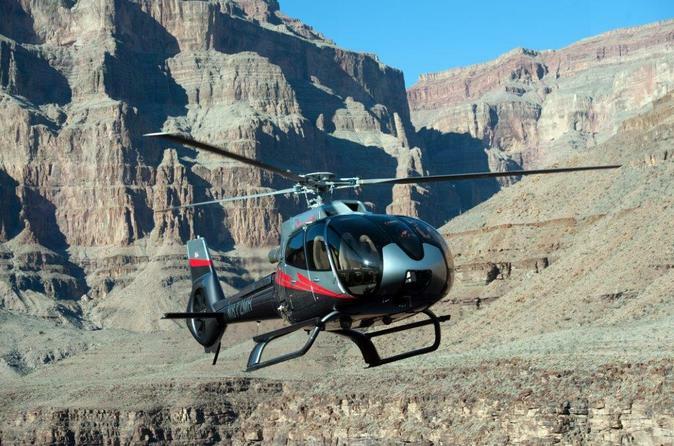 See the Grand Canyon on this thrilling helicopter tour from Las Vegas! Enjoy breathtaking views as you fly over Hoover Dam, Lake Mead, Fortification Hill and many other awe-inspiring sights. As you near the magnificent Grand Canyon, where you’ll descend 3,500 feet below the rim to enjoy a light snack and a Champagne toast. This private landing site 300 feet (90 meters) above the Colorado River is the furthest and deepest into the canyon of any other Grand Canyon helicopter tour! After you’ve filled up your camera with photos and soaked in the incredible scenery, head back to Vegas while flying over the famous Strip. Experience the beauty of the Grand Canyon from the air and ground on this 90-minute helicopter tour from Las Vegas. After being picked up from your hotel, you'll be driven to the heliport where you’ll board your air-conditioned Eco-Star helicopter. On your way to the Grand Canyon’s West Rim, soar over Lake Las Vegas and Lake Mead. As you fly over the Hoover Dam, you'll be left in awe at this particularly spectacular sight from the air, curved between the rock canyon walls. Marvel at this architectural wonder and enjoy the amazing views of the recently built bypass bridge. During your flight, you can listen to a recorded commentary about the Grand Canyon and its surrounds via headphones. As you reach the Grand Canyon and fly deeper and further into the canyon than any other helicopter tour, land on a private bluff overlooking the flowing Colorado River. From this incredible perch over 3,000 feet below the canyon rim, toast to your experience with a glass of Champagne and a light snack. While you celebrate and relax under an authentic Native American ramada shelter, your pilot will be happy to answer any questions you have about the canyon or your helicopter flight. Back in the helicopter, enjoy another 45-minute flight back to Las Vegas, this time flying over the world famous Strip. When you land, your transportation will be waiting to whisk you back to your hotel.